Second-graders sleeping in cars, 16-year-olds bouncing between friends' homes, preschoolers living in campers. ... What do they all have in common? Stability at school is a goal for all students, but especially so for students qualified as homeless in the Oregon City School District. During the 2016-17 school year, more than 300 students were identified as homeless. The district is on track to reach this number, if not more, during the 2017-18 school year. Getting students to graduation — career and college-ready — is OCSD's mission. However, for students who don't know where they are going to sleep or get their next meal, focusing on coursework is challenging when they have more pressing needs on their minds. Under the McKinney-Vento Act, schools are mandated to identify and support homeless and housing insecure students. This year for the first time, every OCSD staff member has gone through specific training about supporting housing insecure students. While the McKinney-Vento Act helps to support and protect students, it comes with no additional state or federal funding to help this growing need. Beyond the basic training for each staff member, OCSD has two homeless education liaisons, Julie Baumann and Mary Ellen Winterhalter, who work to identify and support students in transition at each of the schools in the district. The homeless liaisons work closely with students in the schools and with families who often are in crisis, to steer them toward resources in the community that may help stabilize their living situations. "We don't use the word 'homeless' when working with our families," Winterhalter said. "Our families are in transition with their housing, and it is our role to help their kids access and engage in school. Sometimes this means tracking down enrollment documents or setting up transportation, but mostly we try to provide for basic needs like free meals, school supplies and referrals to clothing. Every student deserves to go to school clean, fed and ready to learn." Both liaisons work with other dedicated staff and volunteers to ensure that the students they serve are able to access a variety of resources, including a community Clothes Closet, holiday support and The Phoenix and Pioneer Pantries, which provides weekend meals for food-insecure students at area high schools. Unfortunately, the region is seeing a steady increase in the homeless population due, in part, to the shortage of affordable housing. More families are leaving Portland and coming to Oregon City seeking affordable places to live, only to find an extremely low vacancy rate and discover that wait lists are long and options are extremely limited. "The majority of the families we work with include at least one working family member," Baumann said. "But for reasons ranging from job loss or medical events to increases in rent, families have been unable to maintain stable housing. It is not uncommon for families to be notified of a monthly rent increase of hundreds of dollars. In addition, many families receive notices to vacate or no-cause evictions and are unable to secure other housing." 1. Oregon City Schools Homeless Student Fund accepts cash donations to help students with fees to participate in school sports and activities. Donations accepted at the district office, located at 1417 12th St., Oregon City. 2. 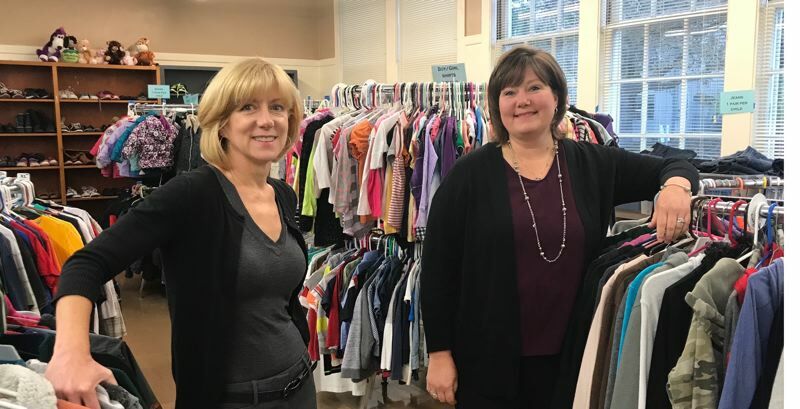 Clackamas County Clothes Closet/Resource Center accepts new and gently used clothing at 817 12th St., Oregon City, 503-785-8880. 3. The Pioneer/Phoenix Pantry accepts specific food items and cash donations. Learn more at pioneerpantry.org.